As “the hybrid that started it all,” it’s no surprise the Prius earns an estimated 51 mpg city and 48 mpg highway. The Prius runs on the Hybrid Synergy Drive System, which combines an efficient gas engine and clean electric motor. Five passengers can fit comfortably inside the Prius, which offers available SofTex-trimmed seats. The Prius can generate up to 134 net horsepower with its hybrid system. Drivers can unlock and start the Prius with the help of the Smart Key System. Seven advanced airbags protect passengers inside the Prius in the event of unexpected impact. The Toyota Prius revolutionized the hybrid segment when it arrived in the automotive industry over a decade ago (14 years to be exact). Making efficiency mainstream with its incredible performance and uncompromising capabilities allowed the Prius and all other hybrid vehicles to become staples for drivers across the globe. The 2015 Toyota Prius in Janesville, WI utilizes the Hybrid Synergy Drive system, which is comprised of a fuel-saving gasoline engine and an efficient, quiet electric motor. The two components work in conjunction to create a performance that’s conscious of the environment without compromising power under the hood. Earning an Environmental Protection Agency (EPA)-estimated 51 mpg city and 48 mpg highway, the Prius has longevity many vehicles can’t achieve on the road. As a certified Advanced Technology Partial Zero Emission Vehicle (AT-PZEV), the hybrid demonstrates a commitment to reducing its carbon footprint. 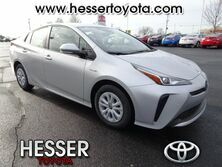 A vehicle as innovatively adept as the Prius can pack a significant amount of technology inside and outside its cabin. The vehicle’s powertrain system has been covered, but the real fun can be found throughout the vehicle’s cabin and dash area. Keeping the environment safe is incredibly important to Toyota, but so is keeping passengers safe, connected and entertained. In the entertainment department, the Prius offers the available Entune App Suite multimedia system, which grants drivers access to all of their favorite on-the-go apps. To stay connected, the Prius offers Display Audio with Navigation and Entune, Display Audio with Navigation, Entune and JBL Audio or the Premium HDD Navigation system with Entune and JBL. For safety, the Prius offers its backup camera to ensure drivers back safely in any situation. Drivers interested in experiencing the 2015 Toyota Prius can schedule a test drive at Hesser Toyota today.